The price of success: City fans to Blame for underselling? 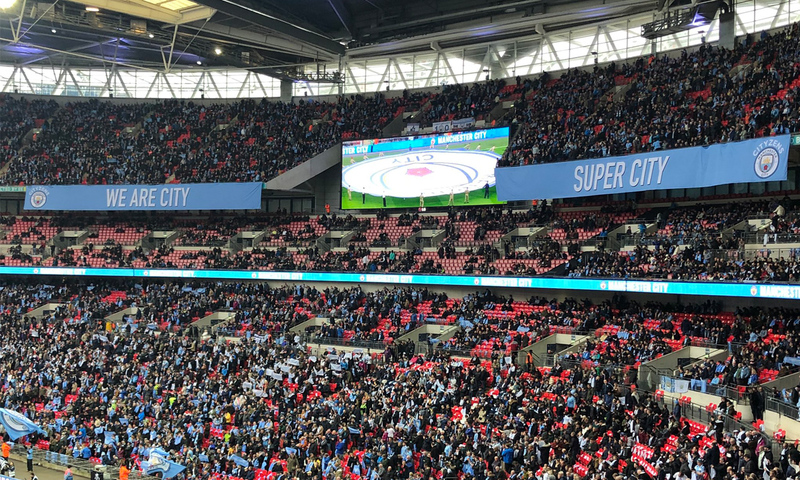 Manchester City Fans at Wembley for their FA Cup Semi-Final Match against Brighton. Success often paints a target on your back, as Manchester City have found in the last week. 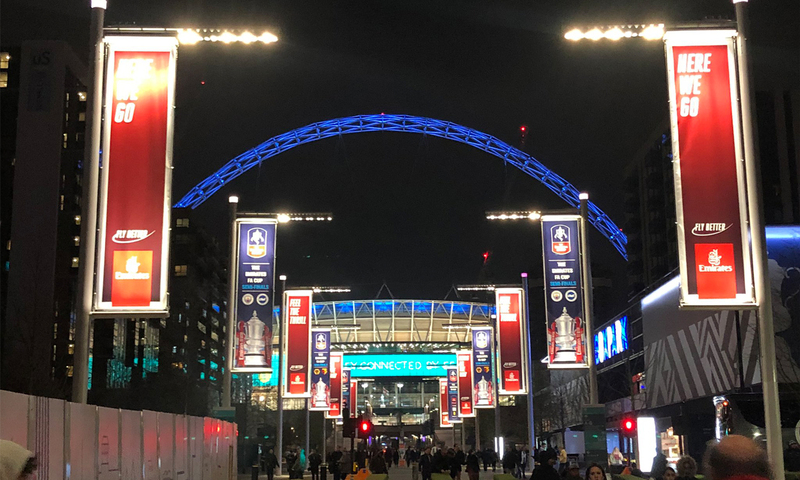 The reigning Premier League champions faced an onslaught of abuse on social media for underselling their allocation in their FA Cup semi-final win against Brighton on Saturday. Brighton, who are undeniably a smaller club with a smaller fanbase than City, sold out their percentage of Wembley seats, whilst City were forced to return over 3,000 of their originally assigned allocation. Even then, City still undersold those that remained, leaving cracks of wembley red breaking through the sky blue City ranks. But what led to this lack of attendance? During City’s meteoric rise over the last decade, they have won three Premier League titles, four Football League trophies, one FA Cup, and two community shields. But their fanbase, whilst fiercely loyal, has remained mostly the same size during this time. The crowd that was selling out the 35,000 seat Main Road in Division 1, is now struggling to consistently fill the 55,000 seat Etihad Stadium. Most teams that become this successful are party to plenty of so-called ‘bandwagon’ fans, who turn up when the going’s good, then disappear when the success dries up. But being in the shadow of one of the biggest clubs in the world has definitely affected the amount of fair-weather fans that City have been able to draw in. Historically, City played second fiddle to their red neighbours Manchester United, but with City’s quite literal change in fortune, they are now their competitive equal/better. It’s also important to consider the cost of this level of success for the average supporter. Wembley tickets can cost upwards of £80 for standard entry depending on the seat. Not to mention the £50-£100 that a match-goer will have to hand over for travel. Add on the frankly extortionate Wembley concessions, with a couple of pints for good measure, and a supporter is looking at a £200-£300 day out. Most fans are able to write this cost off with a trip to Wembley as they usually come few and far between, but for City this was their 4th trip to Wembley this season, and with the win another will be coming. Alongside their Premier League and Champions League fixtures, that equates to 4 games in London in the space of 16 days playing Fulham, Brighton (Wembley), Tottenham, Crystal Palace. Sadly, in these situations there is rarely an easily worked solution. Germany is one of the leading nations in terms of fan satisfaction in European football. Their ticket prices are sensible, with the cheapest average season ticket in the Bundesliga costing £207.22, and their most expensive average season ticket costing £594.44. Comparatively, the cheapest average season ticket in the Premier League costs over double that of their German counterparts at £467.95, with the most expensive averaging £865.42. The Bundesliga have also subsidised travel in and around the cities matches are held in by including travel costs in the ticket price, so no paying for busses, trains, trams, or the underground when you arrive within the city. However, with the rampant commercialisation of English football thanks to the international draw the Premier League brings, it’s hard to see a system like that being implemented any time soon. The powers that be will likely move to consolidate their power, ensuring their investments are safe, further shifting the beautiful game into an ugly business.